The Book of Abraham is cherished among Mormons and is included in the Pearl of Great Price. At the beginning of the book, there are three different Facsimiles, pieces of ancient Egypt scrolls, that Joseph Smith used during his translation process of the book. Today, we will focus on Facsimile 1. Based on part of this image, Joseph got a better understanding of Abraham of the Bible’s life. Abraham was fastened to the altar, while an idolatrous priest was about to kill him. This was when an Angel of God stopped everything. Joseph goes on and says that the figures below are idols and that below it all are pillars of heaven. If this was true then, we’d surely gain more insight on Abraham’s life. However, this Facsimile was later translated by Egyptologists and found to be a totally different translation then what Joseph Smith thought. Fig. 1. The Angel of the Lord. Fig. 2. Abraham fastened upon an altar. Fig. 3. The idolatrous priest of Elkenah attempting to offer up Abraham as a sacrifice. Fig. 4. The altar for sacrifice by the idolatrous priests, standing before the gods of Elkenah, Libnah, Mahmackrah, Korash, and Pharaoh. Fig. 5. The idolatrous god of Elkenah. Fig. 6. The idolatrous god of Libnah. Fig. 7. The idolatrous god of Mahmackrah. Fig. 8. The idolatrous god of Korash. Fig. 9. The idolatrous god of Pharaoh. Fig. 10. Abraham in Egypt. Fig. 11. Designed to represent the pillars of heaven, as understood by the Egyptians. Fig. 12. Raukeeyang, signifying expanse, or the firmament over our heads; but in this case, in relation to this subject, the Egyptians meant it to signify Shaumau, to be high, or the heavens, answering to the Hebrew word, Shaumahyeem. 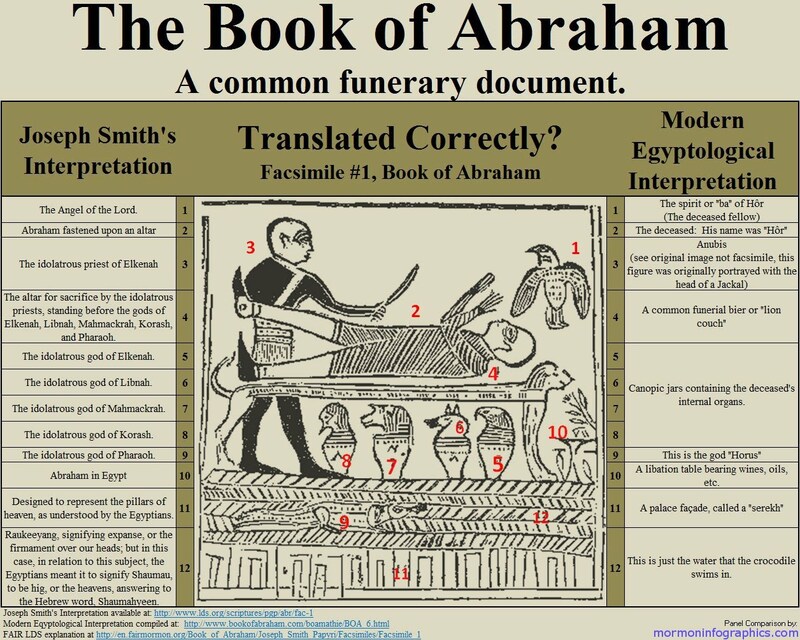 Because Joseph Smith literally translated these different figures in the papyri, in order to know more about Abraham, then we really need to know if it holds water. Fortunately, Egyptologists have seen it and have translated it. Let us get right into the modern Egyptological Interpretation of Facsimile 1. The man on the alter was a man named “Hor”, translated, “the deceased”. The person with the knife in his hand is called “Anubis”. What he is lying on is a common funeral bier or “lion couch”. The jars below it are filled with deceased internal organs. What looks to be a bird is the spirit of the dead person “Hor”. Down at the bottom is “A palace, façade, called a “Serekh”. What was Anubis doing? He was resurrecting “Hor” from the dead. As you can see here, Joseph Smith’s translation does not hold up. Nothing he said about this Facsimile appears to be correct. Fig. 1. The spirit of “ba” or Hor (The deceased fellow). Fig 2. The deceased: His name was “Hor”. Fig 3. Anubis (see original image not facsimile, this figure was originally portrayed wit the head of a Jackal). Fig 4. A common funeral bier or “lion couch”. Fig 5-8. Canopic Jars containing the deceased internal organs. Fig 9. This is the god “Horus”. Fig 10. A libation table bearing wines, oils, etc. Fig 12. This is just the water the crocodile swims in. This article continues on and says. “None of the characters on the papyrus fragments mentioned Abraham’s name or any of the events recorded in the book of Abraham. Mormon and non-Mormon Egyptologists agree that the characters on the fragments do not match the translation given in the book of Abraham, though there is not unanimity, even among non-Mormon scholars, about the proper interpretation of the vignettes on these fragments. 27 Scholars have identified the papyrus fragments as parts of standard funerary texts that were deposited with mummified bodies. These fragments date to between the third century B.C.E. and the first century C.E., long after Abraham lived.” As you can see here. It is not just my point of view on this matter. Egyptologists and Mormon Scholars now agree that this fragment was part of their Egyptian funeral texts. To conclude, the Facsimile 1 papyri is proven to be a false translation. It is not about Abraham, but about an Egyptian Funerary document. So Joseph Smith either lied about this translation or it translated, believing in what he thought it said. Either way, this makes him a false prophet. If a prophet says he has translated a book of scripture and then it is later translated and found to be something entirely different, that makes the prophet a fraud. 1“Beware of false prophets, which come to you in sheep’s clothing, but inwardly they are ravening wolves.” Since Joseph Smith is a false prophet then the Mormon Church is also false. Don’t just agree with me but also the 27 other Mormon scholars that agree that Joseph Smith’s translation is wrong. I hope you understand the severity of this and decide today to follow the Lord and leave the Mormon Church. God bless you and your new journey in learning the truth of God, through the Bible. Oh Lord, I pray that the truth about Joseph Smith’s translation of the Book of Abraham will come to light. May more people look at the facsimile’s of the papyri and look at what the Egyptologists are saying. To know that even Mormon scholars say that his translation of the papyri is wrong then the words needs to get out there. Please Lord, broadcast the news upon the housetops. May everyone that is Mormon now, come to know this. Set a revival in their hearts to come to know what is true and leave what is false behind. I am grateful to have done this. The day I put my trust in You above all, was when things started changing for the better. My wicked heart was changed. My sins were forgiven by Your blood. Thank you for rescuing me and delivering me from my deception. I love You above all things. I give my life to You Lord. Amen. Living For God Or This World?